Beads are available in different shapes and sizes, made from different materials and they can also be finished in a variety of ways. 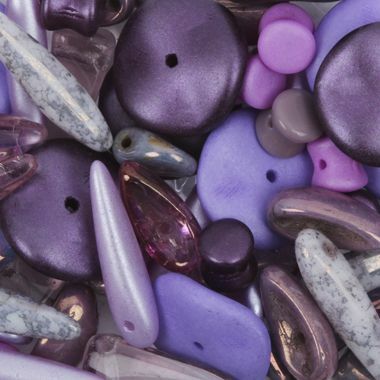 The information below runs through the most common bead finishes to help explain how a finish can change or enhance the appearance of your beads. 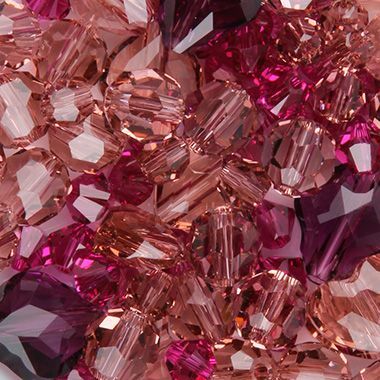 Finishes are applied on top of the bead after it has been formed, and some are specific to certain bead types. AB stands for Aurora Borealis (the northern lights) and is a half coating that reflects a multitude of colours. This durable multicoloured shiny finish is applied by fuming metal salts onto the hot glass for a permanent bond. AB 2x is a double AB finish so the coating is more intense. Colour-lined beads are made with transparent glass but have an opaque colour dyed or painted inside the hole. This colour is protected from excessive abrasion but can be rubbed off by thread. 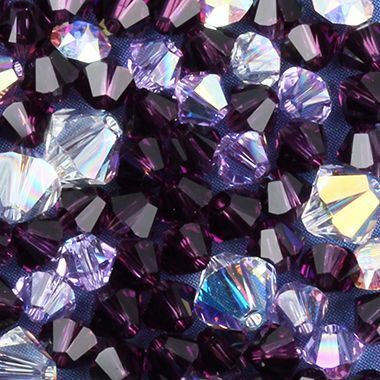 Iridescent (or Iris, Aurora Borealis (AB) or rainbow) beads are transparent, opal or opaque beads with durable multicoloured shiny finishes applied by fuming metal salts onto the hot glass for a permanent bond. Matt (known as matte in the US) have flat, dull or frosted finishes. 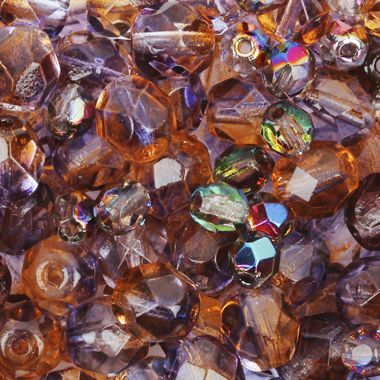 Lustre beads (known as luster in the US) are transparent, opal, or opaque beads with transparent, uniform shiny finishes that are usually permanent. Opaque lustre beads are often called pearl and opal lustre beads are sometimes called Ceylon. Metallic (or galvanised) beads are glass beads that have a shiny, metal-like surface coating which is usually a baked-on paint. The coating may wear off over time. Opaque beads transmit no light and you cannot see through them. Silver-lined (or silverlined or SL) beads are made with transparent or opal glass and have a mirror like reflective lining in their holes. Usually, but not always, the hole is square to enhance the bead’s reflectiveness. Opal beads transmit light but are milky or translucent. Good opal glass glows like an opal gemstone. Satin beads look striated or layered because of the many minute air bubbles pulled through while the molten glass is formed. The apparent shade varies with viewing angle. Translucent beads transmit light and you can see through them though not clearly. Transparent beads transmit light and you can see clearly through them. Painted or Dyed beads have bright or unusual colours achieved by applying dye or paint to the finished beads with heat and solvents. These dyes can wear off. Pavé beads have many stones set closely together to create a sparkling effect. They are often used to make bracelets and earrings but can be used for other types of jewellery.